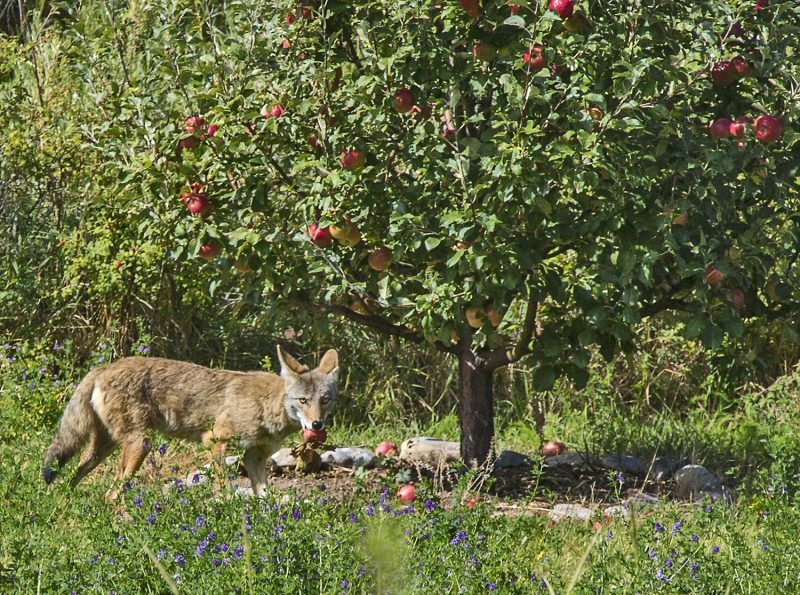 Coyotes prefer meat, but they’ll also eat insects, fruit and grass if that’s what’s available. Coyote and apple. Richard Hasbrouck captured this shot in the summer of 2012. Canon EOS Mk III, Canon 24-105 mm @ 105 mm, f/5.6, 1/200 sec, ISO 400. Taken in our yard in the rural mountain village of Truchas, New Mexico. When I looked out the window there was “Trixter,” the name Navajos give to coyote. He was looking over some of our fallen apples. Fortunately, my camera was at hand so I was able to document him departing with an apple in his mouth. This was a one-time event.